Limo Hire for General Car Hire Use - Chauffeured transportation services in Sydney by Corporate Cars :: Hiring cars for Dinner Transfers, Anniversaries, Birthdays and any Special Occasion. 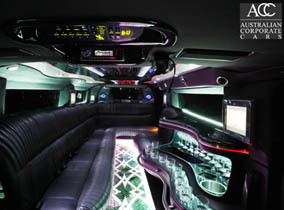 No matter what occasion, how big or how small, let one of our chauffeurs transport you around in ultimate luxury. Bask in the atmosphere of real leather upholstery, luxury interiors, and enjoy added touches like your own cocktail bar, TV, DVD, CD, Play Station 2 with stereo & video. Our limousines are IPOD ready. Relax in the luxurious leather seats whilst enjoying a glass of champagne and let our experienced chauffeurs attend to all your needs.